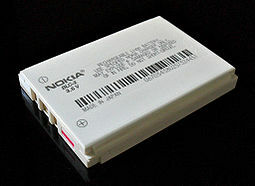 A lithium-ion battery (whiles Li-ion battery or LIB) is a member o a faimily o rechairgeable battery teeps in which lithium ions muive frae the negative electrode tae the positive electrode during dischairge an back when chairgin. ↑ 1.0 1.1 "Rechargeable Li-Ion OEM Battery Products". Panasonic.com. Archived frae the oreeginal on 13 April 2010. Retrieved 23 April 2010. ↑ "Panasonic Develops New Higher-Capacity 18650 Li-Ion Cells; Application of Silicon-based Alloy in Anode". greencarcongress.com. Retrieved 31 January 2011. ↑ Abe, H.; Murai, T.; Zaghib, K. (1999). "Vapor-grown carbon fiber anode for cylindrical lithium ion rechargeable batteries". Journal of Power Sources. 77 (2): 110–115. doi:10.1016/S0378-7753(98)00158-X. This page wis last eeditit on 13 Apryle 2018, at 00:47.